Metagenics Metagenics NanoCell-Q Orange 5 Fl. Oz. 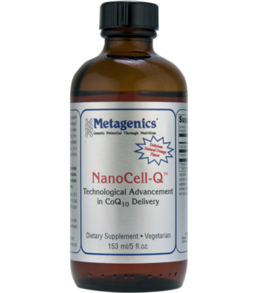 https://www.naturescountrystore.com/media/ecom/prodsm/nanocell-q-large_4.png Technological Advancement in CoQ10 Delivery* Health & Beauty > Health Care > Fitness & Nutrition > Vitamins & Supplements MetagNanoCellQ 38.25 Nature's Country Store new in stock https://www.naturescountrystore.com/Item/MetagenicsNanoCell-QOrange5Fl.Oz. Store Home > Metagenics NanoCell-Q Orange 5 Fl. Oz. NanoCell-Q™ features CoQ10 produced through advanced nanomicelle technology†—delivering 1,000 times smaller molecules than other micelle technology formulas, which may put the active ingredient closer to cell membranes. CoQ10 plays a key role in cardiovascular health. Nanomicelle technology allows fat-soluble CoQ10 to become water-soluble. Single teaspoon dose for convenience. Delicious, natural orange flavor to promote compliance. Great for patients who prefer liquid delivery. Ingredients: Water, fructose, polysorbate 60, CoQ10, sorbitan mono-oleate, polysorbate 80, propylene glycol, vegetable oil, sodium citrate, citric acid, potassium sorbate (preservative), sodium benzoate (preservative), and natural orange flavor. DIRECTIONS: Shake well before using. Take one teaspoon (5.1 ml) daily either alone or added to a cup of any beverage, or as directed by your healthcare practitioner.